The engine is ‘Improved Precedent’s or ‘6ft 6in Jumbo’s or ‘Big Jumbo’s No. 2176 Robert Benson. The shed plate is 26 — Edge Hill. Presumably the location is the MSJ&A platforms at Manchester London Road, and the engine is ready to work a train on the Broadheath line. I’m sure Philip’s identification of the site is correct, despite the apparent lack of old photographs of the west end of London Road's MSJ&A platforms. The tall building would be the C&W Dept offices on platform 7 (old numbering) of the main station. 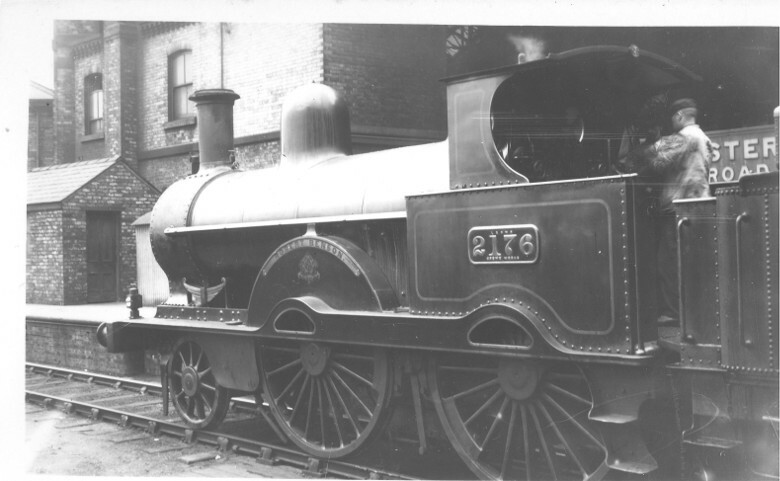 Eric Mason visited Manchester in 1910 if not earlier, and in the 1920s he worked at nearby Agecroft engine shed, so I suppose the date of his photograph could be as late as 1927, when No 2176 was scrapped, still carrying its LNWR number. Eric Mason was born on 14th November 1894, which is a clue to the earliest possible date for the photograph - say c.1910. In 1919 he became Shed Foreman at Agecroft, and remained there until his final appointment as Assistant District Motive Power Superintendent at Stoke-on-Trent in 1939. He wrote The Lancashire & Yorkshire Railway in the 20th Century (Ian Allan, 1954) and — under the pseudonym ‘Rivington’ — My Life with Locomotives (Ian Allan, 1962). He died on 10th January 1970.